The ugly lines of the Park Royal inspired Roe bodies on the early Atlantean chassis are barely disguised by the Devon General livery in this photo taken in Teignmouth on a sunny day in July 1973. I suppose we should be thankful that it hasn’t yet succumbed to the insipid NBC poppy red colour scheme. I’ve seen plenty of examples of poorly located bus stops, but this one looks to be an extremely challenging stop to catch a bus from! Ian, I think a lot of the problem with the appearance of DL901 arises from the over-zealous use of front facing advertising literature coupled with the opening front lights which really squash up the windows. Sheffield had half a dozen similar Roe-bodied Atlanteans which I personally find quite pleasing to the eye bearing in mind it was early days for mass produced rear engine machines. I think the stop in question was only for top-loaders, ie, those of "O (seating) (doorway)" layout. petras409 makes a fair point about the bus stop, if it is for the road on which 901 is travelling, but I think it could be positioned for buses using the road where the people (possibly aging bus spotters marking off numbers in their Ian Allan fleet book) are sitting. Perhaps a member of this site knows the location in question, and if buses traverted/traverse that section of road. In today’s more disability conscious world I doubt if that bench would be allowed to be placed in the middle of the footpath. As suggested, the surroundings are more puzzling than the bus! As John D says, the design of early rear engined decker bodies was very much based on function, as Roe designs generally always were. Peaks, glass fibre mouldings, one piece windscreens and fairings came later. This bus has its traits exaggerated by- possibly- the camera angle and the white roof, plus as noted, the window vents. The interesting bit is the bus stop sign and the bench! Possibly the road was not wide enough for two buses of this width to pass (and had only one pavement?) and perhaps there was a one way system for them with a bus stop opposite the seat… but did people sit with their backs to the road? What was the view that demanded a seat to see it, over a busy, noisy main road? Odd. 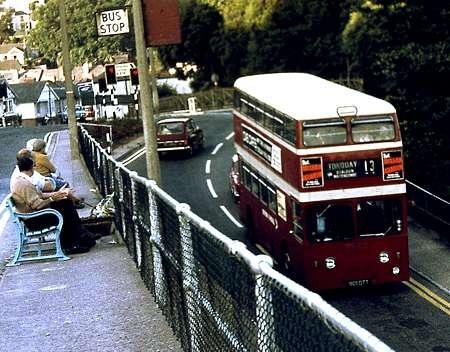 The location is on the outskirts of Teignmouth, and the Atlantean is just descending the "ramp" to Shaldon Bridge, where it would cross the Teign, before heading off along the clifftop run to Maidencombe, St Marychurch and Torquay (present day route 11). The stop certainly relates to the road on the left, which is the main road to Newton Abbot – present day route 2 from Exeter via Exminster, Dawlish, Teignmouth – a journey that takes an hour and three-quarters, every 20 minutes throughout the day. I think that the bus is taking the approach to the T’mouth to Shaldon Bridge and the road on the left is the one to Newton Abbott. It is feasible that there was at that time a stop on both roads explaining the white sign to the left of the pole but the orange rectangle to the right of the pole doesn’t look like a bus stop sign. The seat is, as you say, in the middle of the pavement but is facing that way because that is the view across the estuary. 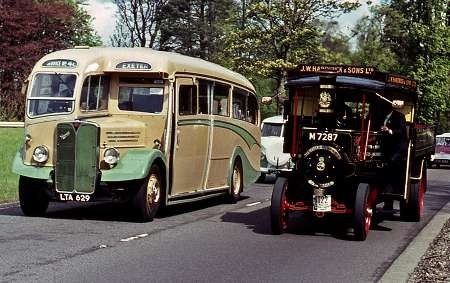 The bus 901 is on the road to Shaldon via a road bridge and en route to Torquay via the coast road. The bus spotters or tourist are looking out over the River Teign from beside the bus stop for the number 2 to Newton Abbot which goes along beside the River, on the top road. A great shot of 901 in our traditional colours. Thank you, Stephen and John, for informing us about the location. Has the stop been declared busy enough or exposed enough to warrant a shelter? One with a normal-sized roof must surely try attaching itself to any "unwary" vehicles coming the other way, up the hill. As my shelter supplier used to say, "It needs a fence panel with an ironing board as a roof." I always thought that Devon General’s livery was superb. The Metro-Cammell bodied Atlanteans were far more attractive than these, especially when viewed from the rear. As seen in Stephen’s Google link, the site of the old bus stop is shown by the concrete post still standing near the seat just a few yards down from the present stop. Although not too clear, there is also a bench in the same place as before, but facing the road this time, with not so impressive a view as before! Nice shot, even to the point of the Austin A40 (seen heading away from camera) being in matching colours to the bus. An extraordinary coincidence! The problem with this body design is that the upper deck windows are relatively shallow, and are also set high relative to the general level of the roof (i.e. the roof is also shallow). This ruins the proportions of the bus as a whole, particularly in the case of full height vehicles, and also has the additional disadvantage that the upper deck windows are too high set for small children to see out. I don’t think the opening front windows really make a difference, but the layout of the colours of the DG livery is not really flattering in this case. The upper deck structure appears to be the same as those infamous Leyland Titans that Southampton CT purchased in the early 1960s, and it also looks the same as that on the early Weymann/MCW lowheight Atlanteans. The lower vehicles looked more acceptable, because the proportions were better balanced, with equal depth windows on the lower deck. There may be good practical and functional reasons for having shallower windows on the upper deck, but the outward appearance can be compromised. The MCW Orion suffered in this respect, but at least the upper deck windows were set lower, and the deeper roof improved the overall look, compared to these PRV/Roe vehicles. Nigel, I have often wondered whether the shallower windows on the upper deck of such vehicles was an attempt by the bodybuilder(s) to standardise the upper deck structure for both lowbridge and highbridge models. Upper deck framing, window glasses, window rubbers, emergency exits and front and rear domes would then be identical regardless of overall height. Also, given that front and rear domes were increasingly being fabricated from GRP around that time, perhaps utilising only one shape for the front and one for the back would have made production easier, and/or reduced costs. The influence of the BET Group on bus design should not be underestimated either, and may well have played a part in some designs having a similar ‘look’, despite being from different bodybuilders. These are just thoughts mind. John D – that’s a superb shot of Sheffield 945, looks as though it was brand new when photographed. Thanks for posting. Nigel, I’d not related the shallower roof of the Roe vs the MCW versions of the bodies on early Atlanteans – that makes the difference. I don’t have any records on Devon General’s early Roe bodied Atlanteans, but a shufti on Ebay and Flickr have thrown up interesting anomalies. Amongst the photos of the batch which are subject of this thread, are those of 898 898 DTT, 905 DTT and 901 901 DTT which are shown with the opening front windows on the upper deck and the destination indicator in a mid position between decks. Also shown are pictures of 908 908 DTT and 901 901 DTT (again) but without opening front windows and with the destination indicator moved to a much lower position. The latter two pictures show the buses with the awful NBC red. So, the question is, was there a partial rebuilding programme of this batch? Brendan, I believe that you are correct. I have certainly seen the suggestion that the PRV/Roe bodies with shallow upper deck windows came about as a result of BET pressure on costs repeated elsewhere. Standardisation obviously brings benefits, and it certainly wasn’t invented by the NBC! The Tilling/BTC/THC group managed it as well, but with a lot more style than these PRV upper decks. I presume, and I guess that you can confirm this, that there will be more common parts than just the windows themselves, but presumably some elements of the framework under the skin as well? As far as I can tell, the lengths of the windows on an ECW bodied F-series Lodekka, a VRT and an RELL, were the same, but the depths were different. I suppose, even if it was only the glass, there would still be scope for standardisation of window sliders and hoppers, but I can imagine the operators would have been looking for more. The kings of window size standardisation seem to have been Ulsterbus. 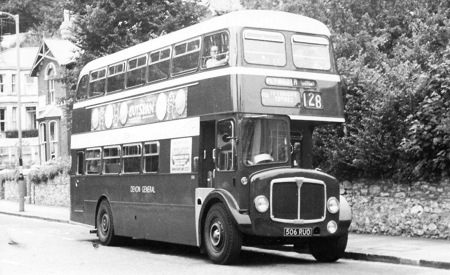 The X type body, fitted to Bristol RELL and Leyland Leopard chassis made extensive use of a standard plain glass, but the last side window was a different shape. The successor body (N type) went even further, using only that standard size, including the window in the rear panel. 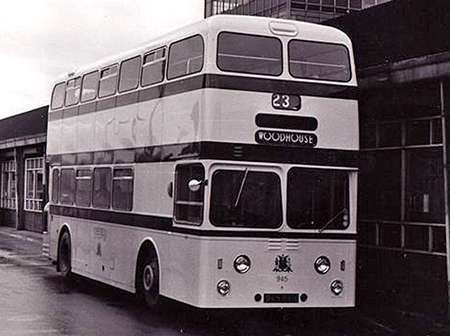 At around the same time, Ulsterbus were buying several secondhand Bristol REs, and they generally stuck to ECW bodies to ensure standardisation. I recall a comment from the management of the company, during a visit there around 1985, saying that they had also bought one (or possibly more) Bristol RESL-8s from Ribble, and they were most disappointed to find that the windows were a different length! The repositioning of the destination boxes on Devon General Atlanteans was the result of One Manning during the 1970s. They had all been delivered with conductor operation in mind, so the destination displays could be changed upstairs, in front of the front seats. Originally, they were nice and clear, with two lines of destination (ultimate and via points), as shown in the picture above. But, as part of the conversion to OMO, the blind boxes were masked down to a single ultimate display and lowered, so that they could be wound from the diver’s seat. This gave the front view a very unbalanced aspect and particularly disfigured the lovely Sea Dog convertible Atlanteans, in their cream and maroon reversed livery. This OMO conversion didn’t affect the upper deck windows, as most of the Atlanteans continued to have opening front windows after the conversion. The pictures you have seen with plain glass may be the result of upper deck repairs following damage. Western National also bought a large batch of MCW Atlanteans from Maidstone & District and similarly ‘uglyfied’ them too, with lower blind boxes. Petras409. Many thanks for the interesting explanation regarding the changed appearance of some of the batch. This very good looking Willowbrook bodied AEC Regent V of Devon General is I think about to start on its long distance run to Plymouth. It had not been in service very long when this shot was taken in the summer of 1964. It is on route 128 which was Torquay to Plymouth, the via blind reads Ivybridge and Totnes but on looking at a map it should be via Totnes and Ivybridge, still it will be right for the return trip. This route was one of the joint service long distance routes operated with Southern & Western National. Devon General also had an agreement with the largest city in their area Exeter, so Devon General buses did quite a few inner city routes and City of Exeter buses would be seen on some of the out of city routes. It is possible that the intermediate display is printed so as to show the places only once, thereby being "wrong way round" on every other journey. This was a fairly common practice where operators quite reasonably sought to avoid wastage of the expensive material. It is a very smart body, perhaps slightly marred by the heavy look of the sliding windows. Amazing how rear wheel ‘spats’ always improve the look of buses. Was this a common feature of Devon General? Most Devon General AECs had rear wheel trims (dustbins) fitted which improved appearance and made it much easier to keep the wheels clean. Does anyone have any information on a very old green bus (could date from as early as the 1920s) which was sited in Wakeham’s Field in Shaldon, Devon in 1951. I came with my parents and sisters to Devon that year and we lived for nine weeks on the camp site whilst waiting for a house. We lived in an old bus for the final few weeks. It had been partly adapted as living accommodation. It had a former Admiral’s (or Captain’s) bathroom area installed – a quite grand mahogany wash basin which lowered down. I have recently seen one of these contraptions on the Antiques Roadshow. I think we still had to pour water from a container into the basin but it drained away after use into the area which would once have been the driver’s place. The bus itself had long seats on the right side as you went in – rows of them I mean, rather than the normal two x 2 each side. Each seat would have taken 4- 5 people. I think some of the windows may have been painted over – probably because there was no way of having curtains. I have never seen a bus of that design anywhere other than the Midlands in the late 40s.